Rankin Lake has been a community landmark for the citizens of Gastonia and Gaston County since its construction in 1922 on 242 City-owned acres as a reservoir to provide the City’s drinking water. Early work to the park by the depression-era Works Progress Administration helped to develop it as Gastonia’s second City park. Rankin Lake Park expanded public recreation in the area and was a favorite spot for family gatherings, picnicking, bank fishing, and other passive activities. To protect the lake as a first class water source, the City fenced off the lakeside part of the property in the late 1980s, which would then deny public access for more than twenty years. 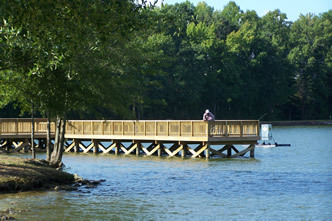 As the lake evolved into a secondary/emergency water source, and governing perceptions changed about public recreation on the lake, the park received the support and funding for a major renovation project that was completed in August 2012. Park Hours of Operation: Dawn - Dusk, daily. The clubhouse and picnic shelters may be rented by families, churches, companies or other groups for a variety of social and business functions. The Administrative Office schedules clubhouse and shelter reservations for Rankin Lake Park. For more information on Rankin Lake Boating and Fishing, see the Quick Links section to the right.